If you don’t know someone who owns a food dehydrator or you simply want to learn how to make dried food without using other devices, try this simple method. For this recipe, you will need a couple of apples. Try the recipe by making a small batch first so you don’t waste your resources, then take note of how you can improve your next experiment. This method, which requires an oven, is perfect if you’re only making small batches of dried fruit. Preheat the oven to 200 degrees F (93.33 degrees C). Once you mix the two ingredients, add the cinnamon sugar mixture to the apples. Mix the fruit by hand to ensure that the mixture coats eat apple slice evenly. Place a piece of parchment paper on a baking sheet. Arrange the apples on the sheet, but make sure the pieces don’t touch each other. Cook the apple slices in the oven for an hour, then turn the slices over. Cook the reverse side of the apple slices for another 45 minutes. Keep an eye on the fruit because your oven times may vary. Once the dried apple slices are done, they will turn brown. If you don’t want your apple slices to turn too brown, you can soak them in a 50/50 mixture of lemon juice and water for an hour before prepping. Use this technique to dehydrate various fruits. With food drying, you can add dried fruits to your stockpile. You can also use it to make affordable and healthy snacks for you and your family. 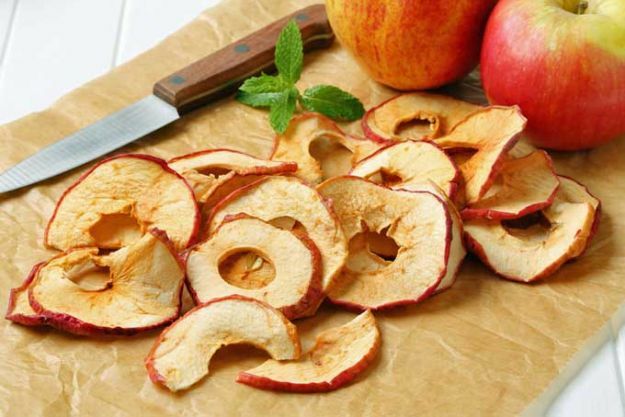 Making dried fruit chips is also a good way to use up fruit before it goes bad in your kitchen. Always use fresh and high-quality food. If you buy in bulk, you can save time and money. Blanching certain vegetables before drying can help keep out bacteria, preserve color, and maintain flavors. Check food for spoilage or bruising, and don’t buy damaged produce. Slice food uniformly and thinly for even dehydration. Smaller pieces of food take less dehydrating time. When setting food on trays for baking, space each piece evenly on food trays for steady dehydrating. When using an oven for food drying, don’t keep temperatures too low or too high. A good temperature is 122 to 140 degrees F (50 to 60 degrees C). If the temperature of the oven is too low, bacteria could grow in the food. Keeping the temperature too high can overcook the food. Turn food and rotate trays while the food is drying up to keep food evenly dehydrated. Food is properly dried if it doesn’t have any “pockets of moisture” and it feels leathery to the touch. Nuts and vegetables must be crispy while meat should be tough. Cool dehydrated food before storing and use airtight containers or plastic freezer bags to keep moisture out. Dried food will attract moisture from the air. Store dried food in a cool, dark, and dry place. Learn more about food dehydration and other food preservation techniques at FoodStorage.news.